Happy President's Day All, hope you had the day off and had some fun. However, we ended up with snow agaaaaaaaaain. Yeah, but can't complain, it allowed me to get some sewing preparation done. I decided to work on the Butterick 5147 jacket that will be paired with my Simplicity 2700 pants of the same fashion fabric. I had cut the fabric back in August and as usual became distracted by other crafting ventures and clipped the cut fabric pieces & pattern to a hanger. There it hung for months... like 6 months. Well today, in an attempt to get this project completed, I began the process of working on it. While sewing, I like to watch sewing dvds for entertainment and selected Palmer/Pletsch's Perfect Fusing and also watched Jacket for Real People - Tailoring Made Easy since that's what I was in the process of working on. 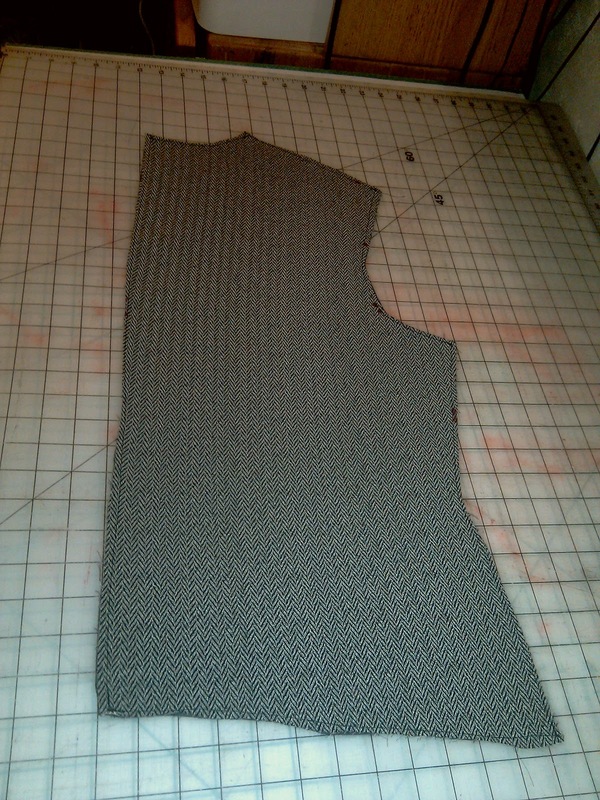 The fabric I chose to use for B5147 is a very drapey polyester and realized that the fabric needed to be stablized. For the pants, I did a full lining and didn't notice much of anything else...mmm, but then again, I thought the pants were longer than I initially thought, but continued without thinking more about it. 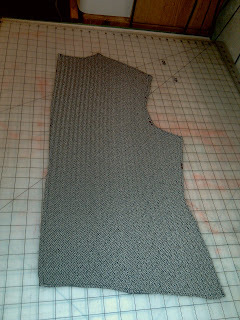 Referring to Palmer/Pletsch's instructions, I decided to do a sew-in interfacing for stablizing the fabric. After preparing the sew-in interfacing, removing pattern paper to cut interfacing, her instructions noted that one should place pattern paper on fashion fabric to insure that the fabric hadn't become distorted. I should have noticed it when I removed the fabric & pattern paper from the clips that the fabric had stretched. Upon laying both on the cutting table the pattern paper had ripples and didn't take note that it was indicative of the fabric stretching. Well... well, I re-positioned pattern paper pieces back on to the fashion fabric and immediately noticed that the fabric had stretched. Thought to myself... this is woven fabric, is it possible that woven fabric can become distorted significantly from months of hanging. My question was answered when I placed interfacing, fabric & pattern paper atop each other and noticed that the length of the fashion fabric was much longer....ugggh. I've hung my knits up for a few days before hemming to insure stretching has taken place, but never having been faced with a woven stretching, I just re-cut the fashion fabric to match the length of the paper pattern & interfacing. I continued on with constructing the jacket and have managed to sew in interfacing, complete darts, sew center back seam, shoulder & side seams and so far it seems to be coming together ok. Lesson learned.... do not hang cut fabric for long periods of time. With all that said has anyone ever experienced this issue? Thanks for posting "your lesson learned". I'll learn from it and try to remember never to do this. Usually when I cut something and don't get to it for a while I place it in one of the super large ziplock bags that I use to carry cut out projects off to sew-a-longs away from home. I guess that is the reason that I've never experienced this. You did great damage control though! Like Faye, if I'm not going to sew a project for a while, I tend to store it in a zip lock bag. I don't know that I've ever thought about it stretching though. 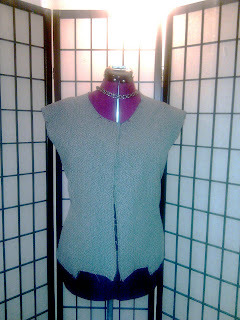 Once I get the shoulders sewn I do hang it. It's something to remember. The jacket's looking good. I've never worried about that. Thanks for the tip. I usually think of hanging as a good thing, especially when something is cut on the bias. Pants look awesome! Yes, woven fabrics can stretch...if cut on the bias, if the fibers have some twist to them, if allowed to hang for some time! *smile* Seriously though I think I would have fused the fabric using a fusible knit interfacing that would have insured that the fabric did not grow and made it really stable. Because once a fabric grows it will continue to grow unless you do something to prevent it from doing so. I've never witness this before, its very interesting. I have experienced this with some woven fabrics, usually those that are loosely woven and with wool crepe. Thanks for sharing your lesson learned. I wish I had had Monday off, I have a lot of sewing going on in my head and would prefer to be doing some actual sewing. Thanks for the information. I have never made anything out of stretchy fabric. The slacks are wonderful and I'm sure you will do just as well with the jacket. Now that you mention that, it does make sense (but no, I've never experienced it and you know why, lol). This is a good lesson to me, though, for the future. 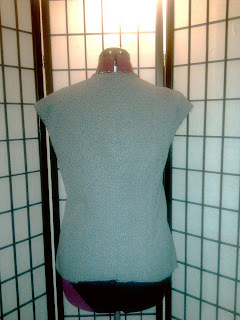 The fabric was not cut on the bias, but thinking another thing that may have contributed to the stretching is that the fabric is not tightly woven, plus its drapey. @ KopyKat-Kim... hanging is good, but thinking since the fabric was cut and the pieces pinned to one another and clipped to a hanger.. just maybe the weight of the pieces pinned together was not a good idea for hanging. @ Carolyn: I hope this jacket doesn't become a one-hit wonder and stretch after wearing. 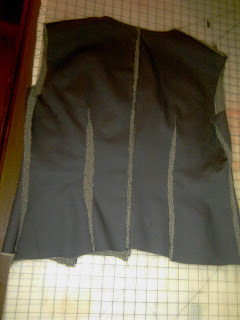 I did use fabric glue and dotted along the seams to prevent the interfacing from shifting while sewing. Crossing fingers that that served as a preventive measure. Tonight, I hope to work on the lining. Sheila - you have me cracking up about the wedgie. Yikes about the stretching! Your crocheting is just pure delight; you are a speed demon. No, I've never experience anything like that before. I would think that particular woven stretched because you mentioned it was kind of "drapey"...how the threads were woven probably has something to do with it. Thanks for the lesson learned, I'll remember that! Haaaaa. 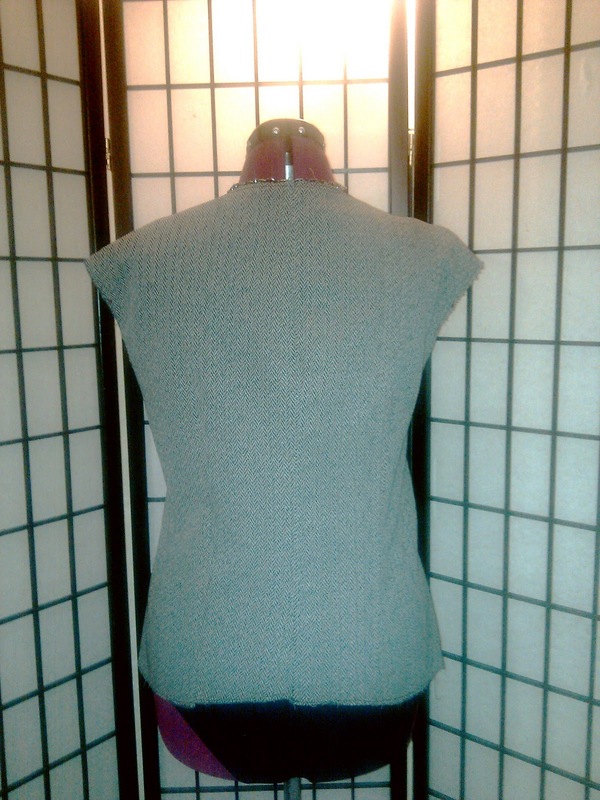 Miss Mannequin with a wedgie! I didn't see it though. Just great to see your lesson. amazing work. thanks for sharing.